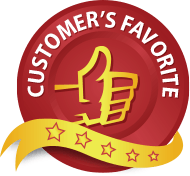 Here we have a review for Colon Cleanse; which is a colon cleansing supplement. Colon health is an issue that most middle aged individuals find themselves considering. From regular colon check ups to probiotic supplements, colon health is something everyone eventually becomes serious about. There are a number of pharmaceutical solutions available on the market today, but for those looking for a natural solution, the options become more limited. It’s for this reason that Research Verified developed Colon Cleanse. Colon Cleanse, a Research Verified product, is an all natural solution to the issue of maintaining a healthy colon. This supplement is formulated to cleanse your body of toxins built up over time, promote regularity, reduce bloating, reduce distention and prevent future complications. This colon cleansing treatment is both gentle and effective. Glucomannan – Relieves the symptoms of constipation. Oat Bran (Avena sativa) – Has appetite suppression and cholesterol lowering properties. Mangosteen (Garcinia Mangostana) – Antioxidant, anti-inflammatory, and anti-diuretic properties. Also treats urinary tract infections. Papaya Leaf (Carica Papaya) – Promotes intestinal tract health and protein breakdown. Black Walnut Leaves (Juglans Nigra) – Anti-fungal, antibiotic, anti-diarrheal and astringent properties. Apple Pectin – Promotes healthy bowel movements. Flax Seed Powder (Linum usitatissimum) – Boosts metabolism and energy. Also has anti-inflammatory and laxative properties. Bentonite Clay – Has detoxification properties. Probiotic (Acidophilus) – Prevents digestive tract infections. Aloe Vera – Has laxative and detoxification properties. Prune (Prunus Domestica) – Acts as a mild laxative. There are separate instructions depending on your intended use. For first time occasional use take two capsules 3 times daily with each meal; that’s two capsules in the morning, two midday and two in the afternoon. For daily colon maintenance take just one capsule in the morning and one in the afternoon. 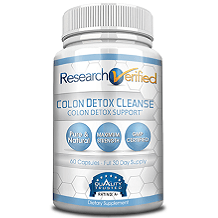 Colon Cleanse by Research Verified sells their individual sample units at $48 per bottle, a savings of $21.95 from the original listing price. This constitutes a months supply of Colon Cleanse. There are also bulk packages available that give you a discount for buying multiple units. Like the other products in the Research Verified supplement line Colon Cleanse comes with an impressive year long money back guarantee. If you find that you are unhappy with your results while taking this supplement at any time during the 365 day period simply return the unused portion for a full refund of the purchase price. There are also packages that give you discount for buying multiple bottles. This is ideal for individuals looking to use Colon Cleanse over the long term. When it comes to colon health you can’t overstate the importance of an all natural supplement that’s safe and clinically proven to work. Colon health is a common issue plaguing individuals of varying ages, but is particularly acute for people in the their mid 40’s.There are a number of pharmaceutical remedies on the market today, but for people looking for an all natural solution to the maintenance of colon health Colon Cleanse is a remedy that certainly fits the bill. Colon Cleanse is clinically proven to purge toxins from your system and with an incredible 365 day money back guarantee Colon Cleanse is the all natural solution to individuals looking for a product with no fillers, preservatives or artificial ingredients.